A former Minister of power, Professor Barth Nnaji and some of the new owners of the distribution company yesterday, declared that Nigerians power generating facility are obsolete and unreliable. They however, suggested embedded generation as short term solution to the current energy challenges in the country. formation and management acumen. What is more, it was started before the Electric Power Sector Reform Act of 2005. As a ring-fenced enterprise, its success is widely regarded as a model of embedded generation projects which the country needs in sufficient quantity to meets its critical power needs. Therefore, the Aba Integrated Power Project has its place in Nigeria’s power sector history. 2. In the zeal to ensure that the project takes off as scheduled, which will see Aba city, the capital of indigenous technology and home to some two million people, become the first place in Nigeria to enjoy uninterrupted electricity supply, some people have made obvious mistakes. For instance, the highly respected Businessday newspaper in the lead story of Monday, April 14, 2014, entitled “Stopping Geometric Power: Deceit, incompetence, corruption prevent $530m Aba Power Project”, alleged that some key public office holders have conspired “to keep Aba in darkness”. The report claimed that the key functionaries have been working in cahoots with a prominent businessman who is also a politician to undermine the Aba enterprise. 3. Frankly, it is almost impossible to carry out an unprecedented project on the scale of the Aba Integrated Power Project anywhere in the world without some issues genuinely developing between the project developers, on the one hand, and government officials, on the other. Sometimes, the issues could also be with some private sector operators. 4. The main issue in the development of the integrated project which apparently led to the news report in question has to do with the controversial sale of the Enugu Electricity Distribution Company in the later part of last year. An error occurred when the Aba ring fence was purportedly sold during the privatization exercise as part of the territory of the Enugu Electricity Distribution Company, thus ignoring some key terms of the extant Lease Agreement between the Federal Government and its agencies, on the one hand, and Aba Power Ltd. and Geometric Power Ltd, on the other hand. The buyer has vehemently opposed Geometric Power’s distribution of power to the ring-fenced Aba metropolis from its 141 Megawatt plant located in the city. The power plant is part of the Aba Integrated Power Project which includes a 27-kilometre gas pipeline, four brand new substations and three comprehensively refurbished ones inherited from the defunct Power Holding Company of Nigeria (PHCN), construction of over 100kms of 33kV overhead lines primarily on unique steel tubular poles. 5. This matter (of the Aba ring fence sale) is being resolved. And, the resolution process was at the personal instance of the President of the Federal Republic of Nigeria, Dr Goodluck Ebele Jonathan, GCFR. The Vice President of the Federal Republic, Architect Mohammed Namadi Sambo, GCON, has been fully in the picture, and has supported it all the way. Among other key public officers involved in the peaceful resolution of the matter are the Honourable Minister of Power, Professor Chinedu Nebo; the Honourable Minister of Finance and Coordinating Minister of the Economy, Dr (Mrs) Ngozi Okonjo-Iweala; the Permanent secretary in the Ministry of Power, Ambassador (Dr) Godknows Igali; the Chairman of the National Electricity Regulatory Commission, Dr Sam Amadi; the Director General of the Bureau of Public Enterprises, Mr Benjamin Dikki; etc. Unfortunately given the ongoing legal process on this issue, the Geometric Power team are barred from discussing the issue with the media, hence without the benefit of our contribution, the story by the Businessday reportorial team has given the erroneous impression that the Government officials are against Geometric Power. We therefore want to state categorically that we are happy with Mr. President’s intervention and the process for a peaceful resolution of the dispute as ordered by the Federal High Court. 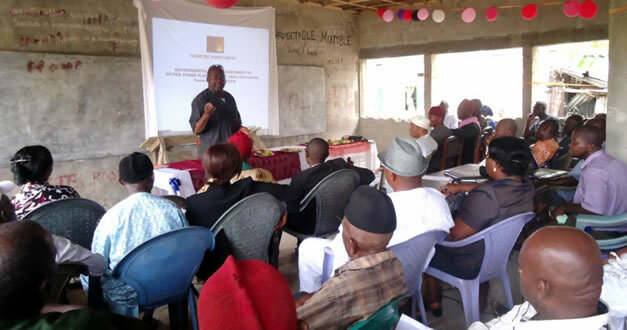 The Town Hall meeting event was introduced to the delegates enunciating the good intentions of the Management of GEOMETRIC POWER LIMITED (GP), the first indigenous power developing firm, for a proposed GP-OMA Power project to be sited on the land located in Ogwe Asaa, Ogwe Autonomous Community of Ukwa West Local Government Area of Abia State. The event which was witnessed by Federal and State Ministry of Environment was sponsored and coordinated by Management of GP-OMA Power. Mr. Nate Obijiofor (standing in the above picture), Aba GM and Project Team Representative presented technical capacity, modus operandi and various stages to be involved in first single circle installations and later combined circle features for the power plant project. In the power point projection beamed for the crowd to marvel at, he showed the management of GP-OMA project, the EPC contractors and enticed the crowd with GP-OMA/community relationships’ benefits that would result from the project. The immediate past Minister of Power, Professor Bart Nnaji, has called on indigenous and foreign electricity firms in the country to utilize immense opportunities provided by a series of Memoranda of Understanding (MoUs) signed by the Nigerian government and international investors in the last one year to accelerate the development of the power sector.